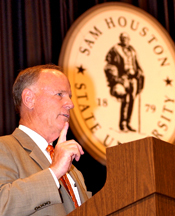 In his traditional fall-semester-opening state-of-the-campus message, SHSU President James F. Gaertner Monday painted a picture of a university moving and improving. Gaertner addressed faculty and staff in the Criminal Justice Center auditorium and also presented awards to employees with 35, 25, and 20 years service, as well as recognizing staff excellence award winners selected last spring. Those recognized for 35 years of service were Leroy Ashorn, Jerry Bruce, James DeShaw, Glen Kercher, Tom Kordinak, Vic Lukaszewski, Maureen McIntyre and Jacque Gilliam. 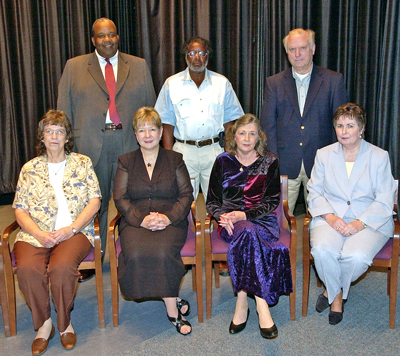 Recognized for 25 years of service were Keith Jenkins, Joe Kirk, Kay Billingsley, Ann Holder, Allene Smith, Julia May, Albert Butcher and Frank Parker. Twenty year service awards were presented to Kristina Hanssen, Jack Turner, Debra McCall, Nancy Templeton-Wilson, Janis Cruse, Cheryl Bumpass, Shelly Smith, Junie MacCormack, Jane Teske, Teresa Ringo, Denise Henry and Jessie Turner. 35-Year Service Award winners, from left, front row, James DeShaw, Maureen McIntyre, Jacque Gilliam, Glen Kercher and Tom Kordinak. Back row, from left, Jerry Bruce, Leroy Ashorn, Vic Lukaszewski. Staff Excellence Award winners Debra Kleppelid, Shirley Miller, and Sherry Hirsch were also recognized. Gaertner complimented the entire university community on efforts which have led to what is expected to be a record fall 2005 enrollment well over 15,000 students. The number Monday stood at about 15,300, Gaertner said, but would change slightly because of drops and adds before the 12th class day deadline. SHSU's minority enrollment is holding steady at about 27 percent, he said, with about 55 percent of Sam students receiving some kind of financial aid and more than half representing their families as the first ever to earn a college degree. 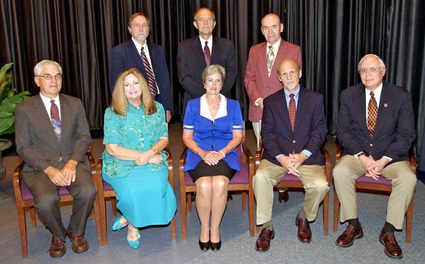 25-Year Service Award winners, from left, Allene Smith, Frank Parker, Julia May, Albert Butcher, Kay Billingsley, Joe Kirk, Ann Holder. Not pictured, Keith Jenkins. The cost of attending SHSU is about $11,500-$12,000 for nine months, he said, which is about average among 35 Texas colleges and universities. "We don't ever want to be near the bottom," he said, "because we're better than that." A special point of pride is that the SAT entrance score average of SHSU students continues to increase and now stands at 1038. "We've blown by the state average of 992 and are above the national average of 1026," he said. Retention rates are also increasing, due in large part to counseling efforts at the SamCenter, which was named one of the top six such programs in the United States last year. SHSU now has about 250 doctoral students, and the criminal justice doctoral progam is the largest in the United States. 20-Year Service Award Winners, from left, front row, Junie MacCormack, Jane Teske, Jack Turner, Kristina Hanssen, Debra McCall. 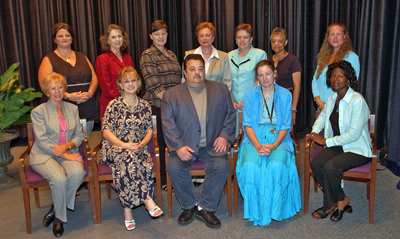 Back row, from left, Teresa Ringo, Nancy Templeton-Wilson, Janis Cruse, Cheryl Bumpass, Shelly Smith, Jessie Turner, Denise Henry. Gaertner recognized individual faculty members who last year had some of the top achievements of any faculty members in Texas or the nation. James S. Olson was named Carnegie Foundation Texas Professor of the Year, Vic Sower was selected as a Piper Professor, and Rolando del Carmen received the Academy of Criminal Justice Sciences Founders Award. Among programs cited by Gaertner were the Alcohol Awareness Program and the Student Health Center, for their efforts after the death of four SHSU students in an 18-month period, with alcohol abuse almost certainly contributing to each. Academic efforts of special note have included award-winning theatre students, the community college administration doctoral program, the College of Business Administration's efforts in banking and professional golf management, and new laboratories established in digital forensics and in criminal justice for crisis events simulations. Athletic achievements last year included winning the Southland Conference Commissioner's Cup for overall excellence, Athletic Director Bobby Williams' receiving the General Robert R. Neyland Outstanding Athletic Director Award from the All-American Football Foundation, and the graduation of all 17 seniors from last season's playoff football squad. Gaertner also noted the new student convocation held for the first time this fall, establishment of the ring ceremony tradition, work toward establishing a nine-hour faculty teaching load, progress toward the university's first capital campaign, and giving rate increases by employees as well as overall donors. Additional accomplishments from 2004-05 included honors by the Orange Pride dance team, Sammy Bearkat mascot, the ROTC program, and the "best ever" issue of the new Heritage magazine, with a circulation of more than 70,000. Gaertner said that although there has been a construction boom on campus, more projects are in the works. They include a performing arts center, removal of Frels/Wilson from the center of the campus although a specific schedule has not been set for that, and beginning construction of conference and recreation facilities on property owned by the university on the Trinity River.